Robert Schumann (June 8, 1810 – July 29, 1856), a German composer and pianist, was one of the most important Romantic composers of the first half of the nineteenth century, as well as a highly regarded music critic. An intellectual and an aesthete, his music reflects the deeply personal nature of Romanticism. Introspective and often whimsical, his early music was an attempt to break with the tradition of the classical music era and form and structure which he thought too restrictive. Little understood in his lifetime, much of his music is now regarded as daringly original in harmony, rhythm, and form. He stands in the front rank of German composers of the nineteenth century. Schumann, can be said to be one of the first truly Romantic composers of the central European music tradition. As with many composers of the Romantic period, the literature of the era played heavily into the inspiration of his creative output. He was a person given to emotional extremes and his marriage to the gifted pianist and composer Clara Wieck would become a stabilizing aspect in his life. Schumann's attitude reflects a central tenet of the Romanticism spirit, namely that music (or any artistic expression) is a direct outpouring of an artist's innermost feelings and emotions. As musicologist Danial J. Grout suggests, "In a very general sense, all art may be said to be Romantic; for, though it may take its materials from everyday life, it transforms them and thus creates a new world which is necessarily, to a greater or lesser degree, remote from the every day world." His music reflected his personal views in almost autobiographical ways. He once stated: "I am affected by everything that goes on in the world—politics, literature, people—I think it over in my own way, and then I long to express my feelings in music." Robert Schumann was born on June 8, 1810 in Zwickau in Saxony. His father was a publisher, and it was in the cultivation of literature and music that his boyhood was spent. Schumann himself said that he began to compose before his seventh year. At fourteen he wrote an essay on the aesthetics of music and also contributed to a volume edited by his father and entitled "Portraits of Famous Men." While still at school in Zwickau, he read the works of Friedrich Schiller, Johann Wolfgang von Goethe, Lord Byron and the Greek tragedians. But the most powerful, as well as the most permanent of the literary influences exercised upon him, was undoubtedly that of Johann Paul Friedrich Richter. This influence may clearly be seen in his youthful novels "Juniusabende" and "Selene," of which the first was completed in 1826. In 1828 he left school, and after a tour, during which he met Heinrich Heine in Munich, he went to Leipzig to study law. His interest in music had been stimulated when he was a child by hearing Ignaz Moscheles play at Carlsbad, and in 1827, his enthusiasm had been further excited by the works of Franz Schubert and Felix Mendelssohn. However, his father, who had encouraged the boy's musical aspirations, had died in 1826, and neither his mother nor his guardian approved of a musical career for him. The question seemed to be set at rest by Schumann's expressed intention to study law. Although he attempted to study in Leipzig and Heidelberg in 1829, he soon neglected the law for the philosophers, and using his own words ("but Nature's pupil pure and simple") began composing songs. The restless spirit which pursued Schumann is disclosed in his letters of the period. At Easter in 1830, he heard Niccolò Paganini perform in Frankfurt am Main. In July in this year he wrote to his mother, "My whole life has been a struggle between Poetry and Prose, or call it Music and Law," and by Christmas he was once more in Leipzig, taking piano lessons with his old master, Friedrich Wieck. In his anxiety to accelerate the process by which he could acquire a perfect execution, he permanently injured his right hand. Another authority states that the right-hand disability was caused by syphilis medication. Those who claim the former state that he attempted a radical surgical procedure to separate the tendons of the fourth finger from those of the third (the ring finger musculature is linked to that of the third finger, thus making it the "weakest" finger). Unfortunately, his ambitions as a pianist were suddenly ruined, and he determined to devote himself entirely to composition. He thus began a course of theory under Heinrich Dorn, conductor of the Leipzig opera. About this time he contemplated composing an opera on the subject of Hamlet. The fusion of the literary idea with its musical illustration, which may be said to have first taken shape in Papillons (op. 2), is foreshadowed to some extent in the first critics by Schumann in an essay on Chopin's variations on a theme from Don Juan, which appeared in the Allgemeine musikalische Zeitung in 1831. Here the work is discussed by the imaginary characters Florestan (the embodiment of Schumann's passionate, voluble side) and Eusebius (his dreamy, introspective side) the counterparts of Vult and Walt in Jean Paul's novel Flegeljahre; and a third, Meister Raro, is called upon for his opinion. Raro may represent either the composer himself, Wieck, or the combination of the two (ClaRA + RObert). By the time, however, that Schumann had written Papillons in 1831, he had gone a step further. The scenes and characters of his favorite novelist had now passed definitely and consciously into the written music, and in a letter from Leipzig in April 1832, he bade his brothers "read the last scene in Jean Paul's Flegeljahre as soon as possible, because the Papillons are intended as a musical representation of that masquerade." In the winter of 1832, Schumann visited his relations at Zwickau and Schneeberg, where he performed the first movement of his Symphony in G minor. In Zwickau, the music was played at a concert given by Wieck's daughter, Clara Schumann, who was then only thirteen. The death of his brother Julius as well as that of his sister-in-law Rosalie in 1833 seemed to have affected Schumann with a profound melancholy, leading to his first apparent suicide attempt. By the spring of 1834, however, he had sufficiently recovered to be able to start 'Die Neue Zeitschrift für Musik', the paper in which appeared the greater part of his critical writings. The first number was published on the 3rd of April, 1834. It effected a revolution in the taste of the time, when Wolfgang Amadeus Mozart, Ludwig van Beethoven and Carl Maria von Weber were being neglected for composers who are, today, considered minor figures. The popular taste at the time ran toward flashy displays of technique, without much in the areas of content or ideas; Schumann campaigned to revive interest in the great composers of the past, while also intervening on behalf of new composers who were attempting to create something more substantial. To bestow praise on Chopin and Hector Berlioz in those days was to court the charge of eccentricity in taste, yet the genius of both these masters was appreciated and openly proclaimed in the new journal. On the other hand, the "Music of the Future," as was called the compositional school of Franz Liszt and Richard Wagner, was condemned by Schumann. Amongst his associates involved with the publication, were the talented composers Ludwig Schunke (dedicatee of Schumann's Toccata in C) and Norbert Burgmueller, both of whom died tragically young. 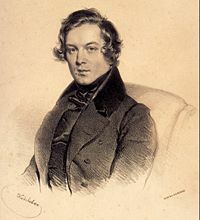 Schumann's editorial duties, which kept him closely occupied during the summer of 1834, were interrupted by his relations with Ernestine von Fricken, a girl of sixteen, to whom he became engaged. She was the adopted daughter of a rich Bohemian, and Schumann borrowed this Bohemian's variations on a theme to construct his own Symphonic Etudes. The engagement was broken off by Schumann, due to the burgeoning of his love for the 15-year-old Clara Wieck. Flirtatious exchanges in the spring of 1835 led to their first kiss on the steps outside Wieck’s house in November and mutual declarations of love the next month in Zwickau, where Clara appeared in concert. Having learned in August of Ernestine von Fricken’s illegitimate birth and fearful that her limited means would force him to earn his living like a ‘day-laborer’, Schumann engineered a complete break towards the end of the year. But his idyll with Clara was soon brought to an unceremonious end. Her father became aware of their nocturnal trysts during the Christmas holidays and summarily called them to a halt. Carnaval (op. 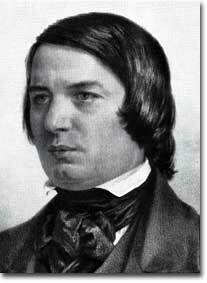 9, 1834) was one of Schumann's most genial and most characteristic pianoforte works. Schumann begins nearly every section of Carnaval with the musical notes signified in German by the letters that spell Asch (A, E-flat, C, and B, or alternatively A-flat, C, and B), the town in which Ernestine was born. Moreover, they are the musical letters in Schumann's own name. Schumann named sections for both Ernestine von Fricken ("Estrella") and Clara Wieck ("Chiarina"). Eusebius and Florestan, the imaginary figures appearing so often in his critical writings, also appear, alongside brilliant imitations of Chopin and Paganini. The work comes to a close with a march of the Davidsbündler, the league of the men of King David against the Philistines in which may be heard the clear accents of truth in contest with the dull clamor of falsehood (embodied in a quotation from the seventeenth century in 'Grandfather's Dance). In Carnaval, Schumann went farther than in Papillons, for in it he conceived the story of which became the musical illustration. On October 3, 1835, Schumann met Mendelssohn at Wieck's house in Leipzig, and his appreciation of his great contemporary was shown with the same generous freedom that distinguished him in all his relations to other musicians. This later enabled him to recognize the genius of Brahms, whom he first met in 1853 before he had established a reputation. In 1836, Schumann's acquaintance with Clara Wieck, already famous as a pianist, ripened into love, and a year later he asked her father's consent to their marriage, but was met with a refusal. In the series Fantasiestücke for the piano (op. 12), he once more gives a sublime illustration of the fusion of literary and musical ideas as embodied conceptions in such pieces as Warum and In der Nacht. After he had written the latter of these two, he detected in the music the fanciful suggestion of a series of episodes from the story of Hero and Leander. The collection begins (in Des Abends) with a notable example of Schumann's predeliction for rhythmic ambiguity, as unrelieved syncopation plays heavily against the time signature (just as in the 1st movement of Fasschingschwank aus Wien). After a revealingly told Fable, and the appropriately titled 'Whirring Dreams', the whole collection ends on an introspective note in the manner of Eusebius. The 'Kinderszenen', completed in 1838 and a favorite of Schumann's piano works, is playful and childlike, and in a wonderfully fresh way captures the innocence of childhood. The Traumerei is one of the most famous piano pieces ever written, and exists in myriad forms and transcriptions. It has been the favorite encore of several artists, including Vladimir Horowitz. Although deceptively simple, Alban Berg in reply to charges that modern music was overly complex, pointed out that this piece is in no way as simple as it appears in its harmonic structure. The whole collection is deceptive in its simplicity, yet genuinely touching and refreshing. The Kreisleriana, which is considered one of his greatest works, was also written in 1838, and in this the composer's fantasy and emotional range is again carried a step further. Kreisler, the romantic poet brought into contact with the real world, was a character drawn from life by the poet E. T. A. Hoffmann (q.v. ), and Schumann utilized him as an imaginary mouthpiece for the sonic expression of emotional states in music that is 'fantastic and mad'. The Phantasie in C (op. 17), written in the summer of 1836, is a work of passion and deep pathos, imbued with the spirit of late Beethoven. This is no doubt deliberate, since the proceeds from sales of the work were initially intended to be contributed towards the construction of a monument to Beethoven. According to Liszt, (Strelezki- Personal Recollections of Chats with Liszt) who played the work to the composer, the Fantasy was apt to be played too heavily, and should have a more dreamy (traumerisch) character than vigorous German pianists tended to labor. He also said, "It is a noble work, worthy of Beethoven, whose career, by the way, it is supposed to represent." After a visit to Vienna during which he discovered Schubert's previously unknown Symphony No. 9 in C, in 1839, he wrote the Faschingsschwank aus Wien, or the Carnival Prank from Vienna. Most of the joke is in the central section of the 1st movement, into which a thinly veiled reference to the 'Marseillaise' (then banned in Vienna) is squeezed. The festive mood does not preclude moments of melancholic introspection in the Intermezzo. As Wieck still withheld his consent to their marriage, Robert and Clara soon made their own decisions, and were married on September 12 in Schonefeld, near Leipzig, Germany. The year 1840 may be said to have yielded the most extraordinary results in Schumann's career. Up until 1840, he had written almost solely for the pianoforte, but in this one year he wrote 168 songs. Schumann's biographers represent him as caught in a tempest of song, the sweetness, the doubt and the despair of which are all to be attributed to varying emotions aroused by his love for Clara. Although there is possibly some truth to this, this rather mawkish view is treated with skepticism by modern scholars, especially since 'Dichterliebe', with its themes of rejection and acceptance, was written at a time when his marriage was no longer in doubt. His chief song-cycles of this period were his settings of the Liederkreis of Joseph von Eichendorff (op. 39), the Frauenliebe und Leben of Chamisso (op. 42), the Dichterliebe of Heine (op. 48) and Myrthen, a collection of songs, including poems by Goethe, Rückert, Heine, Byron, Burns and Moore. The songs Belsatzar (op. 57) and Die beiden Grenadiere (op. 49), each to Heine's words, show Schumann at his best as a ballad writer, though the dramatic ballad is less congenial to him than the introspective lyric. The opus 36 (to words of Justinus Kerner) and opus 40 sets, although less well known, also contain songs of lyric and dramatic quality. As Grillparzer said, "He has made himself a new ideal world in which he moves almost as he wills." Yet it was not until long afterwards that he met with adequate recognition. In his lifetime, the few tokens of honor bestowed upon Schumann were the degree of Doctor by the University of Jena in 1840, and in 1843, a professorship in the Conservatorium of Leipzig, which was founded that year by Felix Mendelssohn. On one occasion, accompanying his wife on a concert tour in Russia, Schumann was asked whether 'he too was a musician'. This and other insults left a mark on Schumann's delicate psyche. Probably no composer ever rivaled Schumann in concentrating his energies on one form of music at a time. At first all his creative impulses were translated into pianoforte music, then followed the miraculous year of the songs. In 1841, he wrote two of his four symphonies. The year 1842 was devoted to the composition of chamber music, and includes the pianoforte quintet (op. 44), now one of his best known and most admired works. In 1843 he wrote Paradise and the Peri, his first essay at concerted vocal music. He had now mastered the separate forms, and from this time forward his compositions are not confined during any particular period to any one of them. In Schumann, above all musicians, the acquisition of technical knowledge was closely bound to the growth of his own experience and the impulse to express it. The stage in his life when he was deeply engaged to composing music to Goethe's Faust (1844-1853) was a critical one for his health. The first half of the year 1844 had been spent with his wife in Russia. On returning to Germany he had abandoned his editorial work, and left Leipzig for Dresden, where he suffered from persistent "nervous prostration" (now referred to as bipolar disorder.) As soon as he began to work, he was seized with fits of shivering, and an apprehension of death which was exhibited in an abhorrence for high places, metal instruments (even keys), and for drugs. Moreover, he suffered perpetually from imagining that he had the 'A' tone ringing in his ears. In 1846, he had recovered and in the winter revisited Vienna, travelling to Prague and Berlin in the spring of 1847. During that summer, he traveled to Zwickau, where he was received with enthusiasm. This was most gratifying because Dresden and Leipzig were the only large cities in which his fame was at this time appreciated. His only opera, Genoveva (op. 81), was completed in 1848 and became known as a work containing much beautiful music, but lacking dramatic force. It is interesting for its attempt to abolish the recitative, which Schumann regarded as an interruption to the musical flow. The subject of Genoveva, based on Johann Ludwig Tieck and Hebbel, was not considered a wise choice, yet it is worth remembering that as early as 1842, the possibilities of German opera had been keenly realized by Schumann. He wrote, "Do you know my prayer as an artist, night and morning? It is called 'German Opera.' Here is a real field for enterprise ... something simple, profound, German." His notebook of suggestions for the text of operas contain amongst others: Nibelungen, Lohengrin and Till Eulenspiegel. Schumann's consistently flowing melody in this work, can be seen as a forerunner to Wagner's 'melos'. The music to Byron's Manfred is pre-eminent in a year (1849) in which he wrote more than in any other. The insurrection of Dresden caused Schumann to move to Kreischa, a little village a few miles outside the city. In the August of this year, on the occasion of the hundredth anniversary of Goethe's birth, scenes of Schumann's Faust as were already completed, were performed in Dresden, Leipzig, and Weimar. Liszt, as always, gave unwearied assistance and encouragement. The rest of the work was written in the latter part of the year, and the overture in 1853. This overture was described by Schumann as "one of the sturdiest of my creations." From 1850 to 1854, the nature, and admittedly the quality, of Schumann's works are extremely varied. In 1850, he succeeded Ferdinand Hiller as musical director at Düsseldorf. In 1851-1853, he visited Switzerland and Belgium as well as Leipzig. In 1851, he completed his glorious (so-called) Rhenish symphony, and he revised what would be published as his Symphony No. 4. In October 1853, he was very impressed by the talent of the 20-year-old Johannes Brahms, who had appeared on his doorstep and spent a month with the Schumanns. During this time, Schumann, Brahms and Schumann's pupil Albert Dietrich collaborated on the composition of the 'F-A-E' Sonata for the violinist Joseph Joachim. Schumann also published an article, 'Neue Bahnen' (New Paths) hailing the unknown Brahms from Hamburg as 'the Chosen One' who would 'give ideal expression to the Age' . In January 1854, Schumann went to Hanover, where he heard a performance of his Paradise and the Peri organized by Joachim and Brahms. Soon after his return to Düsseldorf, where he was engaged in editing his complete works and making an anthology on the subject of music, the symptoms that had threatened him before occurred again. Besides the single note, he now imagined that voices sounded in his ear. One night he suddenly left his bed, saying that Schubert and Mendelssohn had sent him a theme—actually a reminiscence of his Violin Concerto. He hurriedly wrote it down, and on this theme composed five variations for the pianoforte, which became his last work. (Brahms published the Theme in a supplementary volume to the complete edition of Schumann's piano music, and in 1861 wrote a substantial set of variations upon it which became a piano duet, his op.23). On February 27 1854, Schumann threw himself into the Rhine. He was rescued by some boatmen, but when brought to land was determined to be quite insane. Schumann requested to be taken to an asylum and was eventually placed in Dr. Franz Richarz's sanitarium in Endenich. After decades of speculation by pathologists, musicians, biographers and music lovers, the publication of Dr. Richarz's records on his most celebrated patient point conclusively to the effects of tertiary syphilis as the underlying cause of Schumann's many physical and mental illnesses. This, in addition to his introspective, withdrawn character and the treatments he endured, particularly mercury applications, contributed to his ultimate demise. He died on July 29, 1856. He was buried at the Zentral Friedhof in Bonn. In 1880, a statue by A. Donndorf was erected on his tomb. According to studies by the musicologist and literary scholar Eric Sams, Schumann's symptoms during his terminal illness and death appear consistent with those of mercury poisoning. Mercury was at the time a common treatment for syphilis and many other conditions. From the time of her husband's death, Clara devoted herself principally to the interpretation of her husband's works. In 1856, she visited England where the critics received Schumann's music with a degree of coolness with some critics, especially Henry Fothergill Chorley voicing great disapprobation. Nevertheless, she returned to London in 1865 and continued her visits annually. With the exception of four seasons, she appeared there each year. Clara became the authoritative editor of her husband's works for Breitkopf und Härtel. It is rumored that she and her good friend, Johannes Brahms, destroyed many of Schumann's later works that they thought to be tainted by his madness. Yet, apart from the Five Pieces for Cello and Piano, it appears that no other pieces were actually destroyed. As a result, most of the late works, particularly the Violin Concerto, the Fantasy for Violin and Orchestra and the Third Violin Sonata, the latter two from 1853, have entered the performing repertoire as recognized masterpieces. While sometimes being overlooked as a musician of influence, it is undoubtedly true that Schumann exercised considerable influence in the nineteenth century and beyond, despite his adoption of more conservative modes of composition after his marriage. He left a corpus of great music in virtually all the forms then known, and his romantic notions of the musician as an artist, indelibly changed the perception of what being a composer really meant, and means. Through his protege Brahms and others, the stamp of true romanticism remained undefiled. Composers such as Faure and Elgar, ("my ideal," he said of Schumann), as well as many somewhat lesser figures such as Charles Villiers Stanford, Hubert Parry, Verhulst, Adolf Jensen not to mention that master miniaturist, Edvard Grieg, all composed with a distinct Schumannian characteristic. Thus, Schumann's ideals and compositional vocabulary have become widely disseminated. Aside from his music, his critical acumen in encouraging anything worthy yet denouncing the meretricious, set a standard that is still aspired to today. Excellence in music criticism as well as aspiration to the highest ideals in art were embodied by Schumann, and both precepts rely critically even in their conception to Schumann's musical idealism. Those who seek Schumann, and drink deeply at the source, not only receive a deep well of aural pleasure and satisfaction, but commune with a pure and transcendant artistic soul of great integrity. List of compositions by Robert Schumann. "Robert Schumann Works List" – Douglas C. Briscoe, Classical Net. "Schumann cylinder recordings" – Cylinder Preservation and Digitization Project at the University of California, Santa Barbara Library. Donald Betts, "Recording of Kinderszenen (Scenes from Childhood)" – The Inner Voice. "Schumann, Robert" – International Music Score Library Project. Schumann's Scores – Mutopia Project. "Schumann, Robert, 1810-1856" – Gutenberg Project. This page was last modified on 15 July 2015, at 16:12.